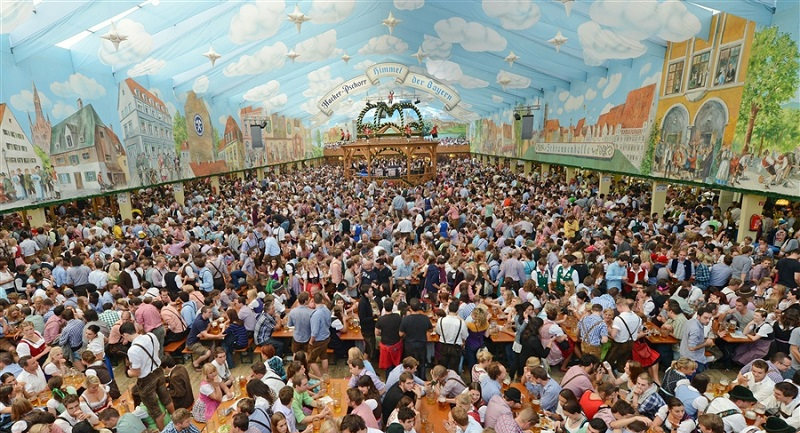 Can't make the time to fly to Munich for Oktoberfest? Host your own Oktoberfest celebration! Only six brewers exhibit at the official Munich Oktoberfest - Augustiner, Hacker-Pschorr, Hofbräu, Löwenbräu, Paulaner and Spaten. Of those brewers, only four currently import to the US: Hacker-Pschorr, Hofbräu, Paulaner and Spaten Oktoberfestbier. Whether you're serving your guests sample flights or letting them choose full servings, be sure to label the beers with as much info as you can. Include the brewer, name of the beer, style of the beer and any interesting facts or trivia. Survey your guests to see which is most popular. Be sure to have plenty of refuse and recycling containers available to make clean up easy and keep things neat. Tent: Originally brewers set up large tents for festival goers. Those tents have become large, permanent halls. Your guests will feel the Oktoberfest spirit with a simple canopy outside. Decorate in either blue and white - the Bavarian flag colors; or red, yellow and black - the colors of the German flag. Pennants, streamers, and "Bier Garten" signs are all inexpensive ways to decorate. If possible provide guests with several tents or canopies, one for the beer and the others as refuge from the sun and a place to sit. Did you know that a full meal is traditionally served at Oktoberfest and roasted chicken is the most popular entree? Soft Bavarian pretzels are staples, often served with obatzda, a Bavarian cheese delicacy. Hard pretzels are fine as a substitute if you don’t have the time or money for homemade pretzels. Dinners often includes Sausages, Potato Salad, Sauerkraut, Red Cabbage, Käsespätzel, Boiled Potatoes and Roasted Chicken. The dessert menu features treats like Apple Strudel, German Chocolate Cake, and heart-shaped gingerbread cookies. Fun Fact: German Chocolate Cake isn't really German even though it's a favorite at Oktoberfest. Follow this link to learn about the origin of German Chocolate Cake. See who can describe the taste of the beer in the most unique way, and who can identify each beer with one sip. Music and dancing will help keep your guest full of energy. Beer song Karaoke, Kazoo playing contest, and polka dancing keep spirits high. Any of the hundreds of drinking games are fun choices, be sure to include activities for any under-age guests to keep them occupied as well. Who would pass up the chance to wear a pair of lederhosen, a dirndl, alpine hat or costume braids? Blue and white or black, yellow and red party beads add fun, can be used as bets in drinking games and make great keepsakes for your guests. Smile for the Camera! There are sure to be lots of smiles so take and post as many pictures as possible. Props, photo frames or even a picture booth encourage snapping pics and sharing. PartyCheap has everything you need for your Oktoberfest Party!